Need a quote? Want to interview a global expert? Desire some relevant research to support your topic? For years, press on both sides of the Atlantic Ocean have been calling on our team - don't hesitate to reach out to our friendly and knowledgable Founders! Download our newest whitepaper for free: Is Your Workforce Ready For AI? Den kleinen High Ender Prysm kennt jeder. Aber die vor 10 Jahren gegründete US-Company hat in Kontinentaleuropa bisher kaum Fuß gefasst. Das könnte sich aus mehreren Gründen bald ändern. Eine Analyse. - Von THOMAS KLETSCHKE 2. Juni 2015 Article found here. GBTA Announces Rana Walker as Featured Speaker at GBTA Conference 2017 in Mexico City – Mexico, Central America & Caribbean. Full article found here and official press release found here. Rana Walker featured in BBTonline after a presentation in Brussels, Belgium. Read more here. 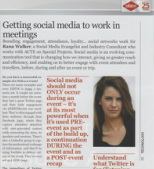 As both of GR&AT's Founders, Glenn Wastyn and Rana Walker, delivered speeches and were subsequently interviewed in EIBTM show daily. You'll find both articles online here, please scroll down to read both: The Mobile Enabled Traveller and Reducing Business Travel Costs. nu draait het om het delen van kennis en het creëren van een positief imago. ​Compatibiliteit en connectivteit. Full article found online ﻿here﻿.